The Terminator is a movie based game that came out 8 years after the movie was in the cinemas. 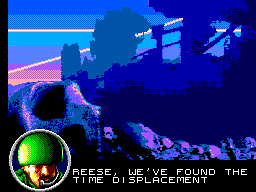 You play as Kyle Reese and you're out on a mission to save mankind. The only way to do it is in a 2D platformer, will Kyle save mankind and protect Sarah Connor? We will see. It's a 2d platformer and in a nutshell, you must find the exit in order to progress to the next level. The levels involve blasting doors, jumping gaps and shooting at anything that moves. The only thing this game doesn't have is power-ups but it's no bad thing. The game starts off with nice introduction screens and when the start button is pressed, it gives a still or two from the movie, which are very good quality. You also get a 'story so far' dialogue. 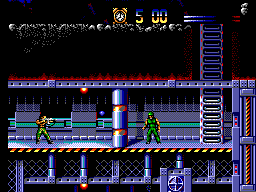 The main game has brilliant animation from Kyle and the Terminator too. The police and punk enemies are well detailed too. A fantasic effort has been put into the graphics. 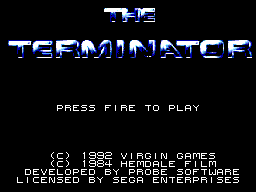 As the game starts the Terminator theme tune plays out which, like the in game music, is great. The sound effects are okay too. The controls are nice and easy so nothing hard here. At first this game is very frustrating and having only 1 life will ensure you keep coming back for more as it plays so well. There is a big challenge at first but soon starts to give in. It still puts up a decent challenge throughout the game, which makes this a firm favorite.